In my recent anniversary post (the link is for those last two readers who missed it somehow) I’ve shared with most of you the idea to designate February as a Month of Irises and invited you all to join me. This is just a short post to explain how I propose to do it. I plan to wear a different iris-centric perfume every day in February, some of them from samples since I do not have 28 iris perfumes (yet?) in my wardrobe. I’d like all of you to join me – for as many days during the month as you want. Unlike both Lucas and I did it last year for A Month of Roses, there will not be a calendar – whenever you feel like that, choose any iris perfume you fancy, wear it and share with us what you wore. Since my blog has tiny audience, I won’t even try to run daily separate SOTD posts. Instead, I decided to do something different: once a week (on February 1st, 8th, 15th and 22nd) I’ll start a post for that day, and then every day will keep updating it with an additional entry. 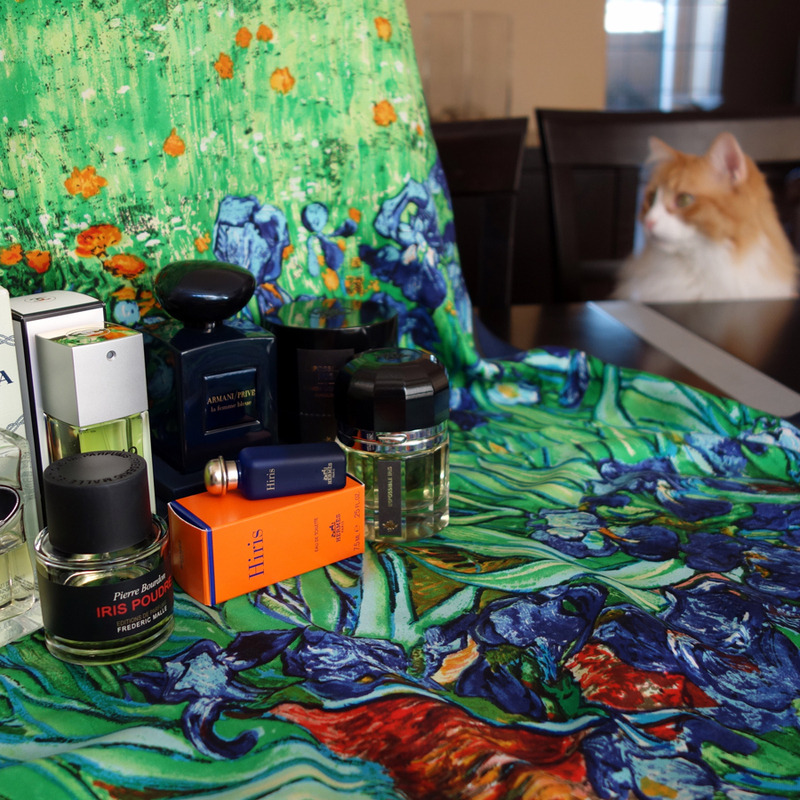 Each day, in addition to sharing with you what perfume I chose to wear, I’ll try to add something entertaining (iris- or perfume-related) – some statistics one day, “did you know?” or “know-how” bits another, puzzles, links or pictures of Rusty, etc. I hope you’ll to come back during the week to see what other silly thing I came up with, tell us what [iris] perfumes you wore or just because. For those of my friends and readers who have their own blogs: if you like the format and would like to host a day or two for any week on your blog, contact me via e-mail, and we’ll work out the details. Ready, steady (set – for my European readers), … see you on February 1st! This entry was posted in "Four legs good", Single Note Exploration and tagged iris perfumes. Bookmark the permalink. Dear Undina, I’ve been terrible at commenting for the last few months, mea culpa. I’ve been reading and kept meaning to come back to comment… anyway, of course I can’t keep away from a month dedicated to iris, so I’m IN! I can’t wait for all the Undina specific stories, puzzles, facts etc re this flower. Thank you, Asali! I missed you but I saw your “Like” and figured out you were too swamped to comment but I knew you were around. Let me know if you want to “host” a day on your blog (see my comment below in reply to Lyubov for explanation what it means – I might have not explained it well in the post). Fab idea! Count me in, because my love for irises and orris butter specifically grew over the years of fumie development. I wore some pretty irises lately, and feel I can easily tune in. I am not quite sure I can come up with a whole article in my procrastinative blogging, but I’ll think about it over the weekend. See you tomorrow! I’ll be glad to see you participating in any way. So no pressure but I’ll try to explain better About the “hosting a day” idea. I didn’t mean anything elaborate but rather a segue into that day’s SOTD but on a blog different then mine. It can be anything theme-related – thoughts (mini-review) of the perfume you choose to wear, some interesting fact about irises or perfumes in general, a picture, a riddle or anything else. Then instead of adding my own section for that day I’d post a link to your SOTD post – and hopefully whoever wants to comment on their SOTD would follow the link and comment on your blog, and you’ll respond to the commenters instead of me since it’s your blog. I didn’t think for too long about this but it was just an idea on how to make it into a community project and try to involve more bloggers. Bring it on & I want to be a part of it of course! I’m lining up my iris samples!! I’m guessing I’ll pick one every few days, I don’t have enough for a month but will seek out the elusive iris note wherever it hides in my bottle collection and add those in too. You do not have to wear different perfumes for each day: I plan to do it because I found enough samples and because I usually do not wear the same perfume even twice in one month. But even if you were to go with the same iris perfume for the whole month, it would have been a great input into our join project. A month of irises, very exciting! Your photo reminds me that a sample of Hiris turned my heart toward iris. I wonder if I could wear Hiris every day in February? Maybe yes, perhaps no, either way it will be highly enjoyable to wear irises for 28 days. Many years ago I suggested this type of experiment (see Imaginary Signature Scent for the idea and the conclusion part for the results) but since then I never wanted to repeat it. I’ll be curious to know how it worked for you if you decide to stick to one perfume for a month (or even week). Hello Undina, I will be eager to read everyone’s list, as I don’t have that many iris perfumes in my collection; the Van Cleef and Arpels one and Dzonga are the only ones coming immediately to mind. I am currently in my husband’s home of Australia where we’re having a three month visit. The only downer of these trips is I have to bring only a small selection of perfumes, and as best I can tell, Adelaide is not a perfume mecca as Melbourne or Sydney might be. So I won’t be able to participate (unless I find a sample with iris…I bought a bunch of samples to try but can’t think of an iris one). Anyway, as I said before, I’ll be following with interest! While you are there, you should investigate perfumes that are either not available here or cost less (I wonder if, for example, Grandiflora’s perfumes are cheaper in Australia. Woo hoo, Iris Month, here I come! I am almost positive I can go the entire month just using my travel spray & FB of iris-forward perfumes, bit I have decants that deserve some love as well! I’ll have to turn to samples for some days (what I normally do not do) but who knows, maybe it’ll turn into more bottles? All samples that I plan to wear I tried before and liked. Count me in! I don’t have that many iris fragrances, but it is rapidly moving up my list of notes I like, so I may be stopping in at a friendly local store where I can get samples. I’ll host one day, so will you tell “hosts” what day you’d like us to do that? Thanks for organizing this, it sounds like fun! I’ll e-mai you in the next couple of days and we’ll agree on the day. But you’ll have enough time to prepare. There are so many great perfumes with prominent iris, that it’s easy to keep finding more and more favorites. Thanks! I’m planning to post about the new Tiffany fragrance, which was a Christmas gift and in which iris is a strong central note. I just replied to your earlier post on this topic, apologising for not feeling sufficiently drawn to iris scents at this time of year to conduct quite such a long trial. I will wear a few here and there – eg on your birthday! – and might surprise myself by finding scents I like being more iris-centric than I realised, but owing to the horrible cold damp weather I am in furry amber comfort mode at the moment, from which it would be hard to prise me away. ;) I wish all the participants the best with this serial wearing game, which is an excellent idea, and as I say, I promise to dip in and join you now and then! It is so warm here (“unpleasantly warm” if you ask my vSO) that ambers did not get enough of my skin space already so it was an easy choice. This sounds like fun! :) I think it would be good for me to join with at least one post. Yay! Let the month of irises begin.